The gift giving season is just about here and I’m ready for all of the book signings and author events to kick into high gear. 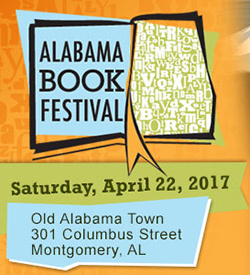 If you’re in the Birmingham, AL vicinity here are three upcoming book related events that may interest you. Authors Hank Early (Heaven’s Crooked Finger) & Carrie Smith (Unholy City) will be signing their books at the Little Professor Book Center in Homewood. Join authors and readers for day of programs, signings, books and lunch as Southern Magic, the Birmingham chapter of Romance Writers of America, hosts Lynn Raye Harris and special keynote speaker #1 New York Times bestseller Abbi Glines. Tickets are $40 and there are plenty of books, goodie bags and door prizes. The Alabama Booksmith is hosting author David DiBenedetto for a signing of his new book S Is for Southern: A Guide to the South, from Absinthe to Zydeco, which compiles a bunch of A-Z stories, anecdotes and definitions from the folks and Garden & Gun magazine. I learned a new word last week: calligram. A calligram is a poem, phrase, or word in which the typeface, calligraphy or handwriting is arranged in a way that creates a visual image. I learned this word from the design-lead for this year’s WordCamp Birmingham Josh Gilmer when he was explaining this year’s event shirt. Isn’t that cool? If you’re from Birmingham, AL you’ll get the reference to Vulcan, if not, you can still appreciate the wordy design aspect of the shirt. The shirt is one of the perks you get from attending this year’s WordCamp Birmingham on October 29th. This site, Headsubhead.com, runs on WordPress and it’s great. WordCamp this year is only $20 and includes access to all of the WordPress-centered sessions, meals, snacks, after party drink tickets, t-shirt, etc. and it’s always a lot of fun. So many cool helpful people there willing to help you and/or learn from you. 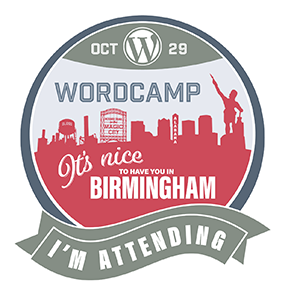 So if you’re in driving distance of Birmingham and want to know more about WordPress, you should check it out. It’s only $20 and only one day. And it’s always worth it. 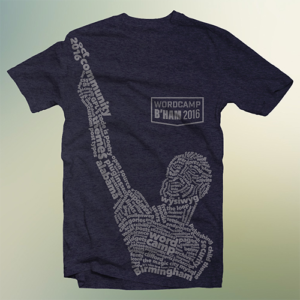 If you’re not near Birmingham, AL, you should check the official WordCamp site for events near you. Even the local meet-ups can be fun and informative. I have attended many WordCamps around the Southeast and have yet to regret it.